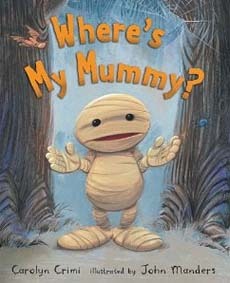 Where's My Mummy -- super CUTE Halloween book for kids! 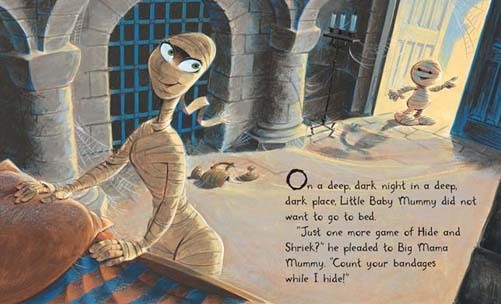 Little Mummy wants to play just one more game of hide-and-shriek with his Mama Mummy before going to bed, but the dark night is full of mysterious sounds and unknown creatures.Who will comfort Little Mummy if someone gives him a scare? Why Mama Mummy, of course. ADORABLE illustrations and a little bit of suspense make this a perfect Halloween treat. * An International Reading Association Children's Choice Book! In case you cant read it, the text reads "On a deep, dark night in a deep, dark place, Little Baby Mummy did not want to go to bed. " Just one more game of Hide and Shriek?" he pleaded to Big Mama Mummy. "Count your bandages while I hide!" "I'm not scared!" 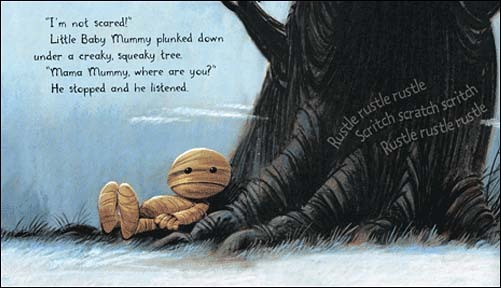 Little Baby Mummy plunked down under a creak, squeaky tree. " Mama Mummy, where are you?" He stopped and he listened. Rustle rustle rustle. Scritch scratch scritch. Rustle rustle rustle. 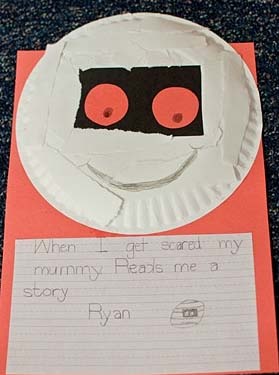 We use the writing prompt suggested on the blog: "When I get stared, my mummy..." (Be sure to talk about the play on words, so that kids don't misunderstand and think that mommy is really spelled with a u! Want to see more books from our best Halloween kids books list?